Alec Wyble-Meza is a 5-foot-11 195 pound running back who announced today his intent to play for the Cougars as part of the Class of 2019. 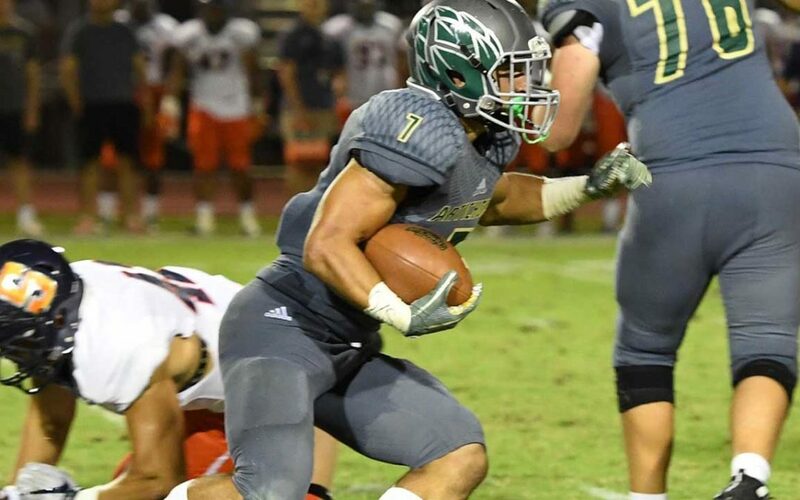 Wyble-Meza spent last season at Scottsdale Community College where he was second in the conference (and 8th nationally) in rushing with 181 carries for 1018 yards (5.6 avg) and six touchdowns. He was the team’s offensive MVP. Meza also represented the United States in 2018 on the Under-19 National team in the world championship. Meza prepped at Santa Cruz Valley High School (Eloy, AZ), where as a senior he carried the rock 85 times for 1109 yards (13.0 avg) and 17 touchdowns. He also had three receptions for 107 yards and two more scores. On defense he had 52 tackles, one tackle for loss, one quarterback hurry, one sack, one forced fumble and two fumble recoveries, and one interception. Meza was named to the all-region first-team and was the Region’s offensive MVP. Meza is being recruited by Adams State, Eastern New Mexico, Fort Lewis, Jacksonville, South Dakota School of Mines, and Wagner. He will be joining the Cougars as a preferred walk-on. Class: 2019 HT/WT: 5’11”, 195 lbs. I caught up with Meza to ask him about his recruiting. Meza: I chose BYU because after going around campus and meeting the players and coaching staff, it just felt like home. There is an incredible feeling when you are at BYU. I look forward to contributing in any way that I can to help the team win and be successful. Meza: Eastern New Mexico, Fort Lewis, Adams State, South Dakota Mines, and Jacksonville University. Meza: One of my favorite movies are Megaladon, my favorite show is George Lopez, and one of my favorite songs is called Chosen One by NBA Youngboy. Meza: Being able to represent the United States for the world football championships held in Mexico. Also, being the first person in my family to play a collegiate sport. Meza: A couple players in college that I like to watch are Eno Benjamin, Dandre Swift, and Jonathan Taylor.